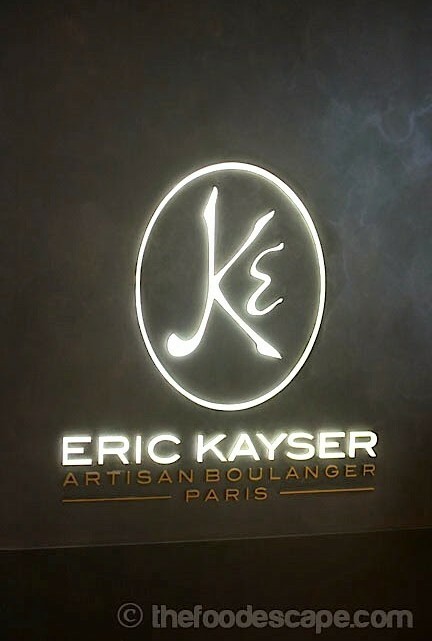 After the success of Paul Bakery & Patisserie in Jakarta, people here had been waiting for another popular French bakery, Eric Kayser Artisan Boulanger. The news about the opening of this particular bakery was already heard since some months ago, and the long awaited day finally arrived! Eric Kayser Artisan Boulanger has officially opened on the 3rd floor of Plaza Senayan since Monday, April 7th, 2014. Now people may think, why is there so much fuss about this bakery? 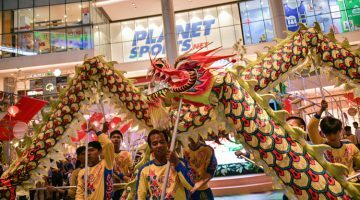 Well, there are always interesting stories behind popular brands, don’t you think so? 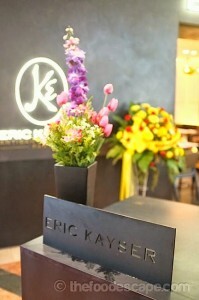 Eric Kayser Artisan Boulanger is a creation of Éric Kayser, a world renowned French baker and food writer. He was born in a traditional French baker family, and as the 4th generation of French baker, he finally opened his own bakery in year 1996, gaining much success and loved by the people. 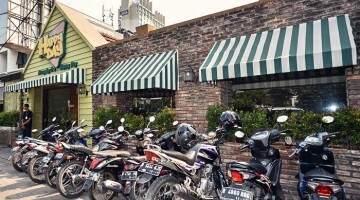 Nowadays, the bakery can be found in 80 locations worldwide. 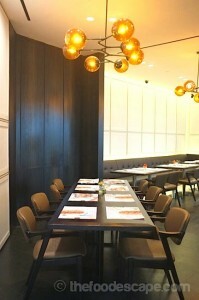 The place is not too big but looks very lovely and elegant with simple yet luxurious design. 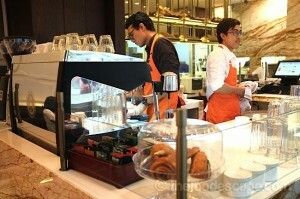 The staffs wear orange aprons, looking fancy and so French (think Hermés!). 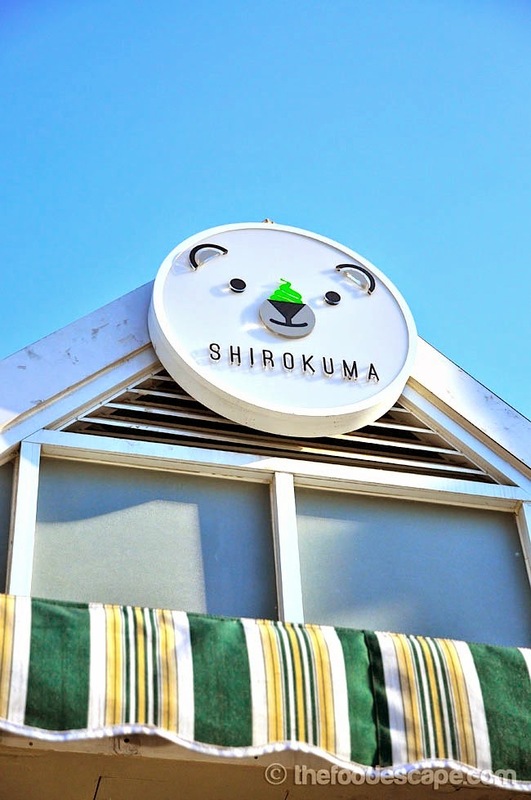 We can choose to sit inside or outside, both sides are similarly comfortable and attractive, in my opinion. There is main station to make the drinks and large glass display showing many beautiful French cakes and another side is walk-in bakery which sells bread and pastries. 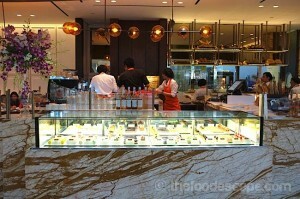 I went there today on the afternoon, so I decided to just try some of their bread, pastries and cakes. 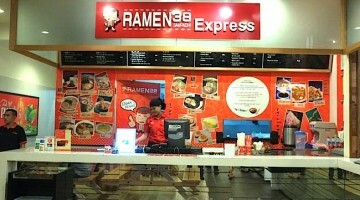 Beside all these stuffs, they also have heavier meals from salads, soups, sandwiches and burgers, pastas and many others. 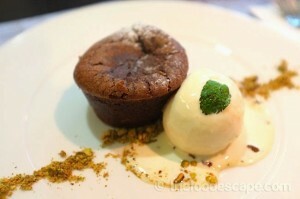 A thin shell of delicious chocolate cake over a hot chocolate lava filling served with vanilla ice cream. 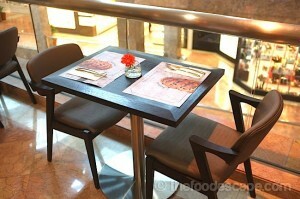 Mi Cuit roughly means “semi-cooked” in French, and this is one of the chef’s recommendations from Eric Kayser. This is EXTREMELY DELICIOUS! The chocolate cake melted right away the moment I put that into my mouth, and the extremely delicious rich chocolate just hit my tastebuds instantly. The cake was super soft and moist, probably the best chocolate cake I have ever eaten my entire life, no kidding! The lava was thick and fragrant, a total guilty pleasure that I for sure can’t resist! Served with vanilla ice cream and crushed pistachios, the plate of dessert quickly was emptied and I tell you, one plate is definitely NOT enough. BTW, you only get the vanilla ice cream if you order the Mi Cuit for dine-in, but the Mi Cuit alone is also available for take away for cheaper price of IDR 45K. 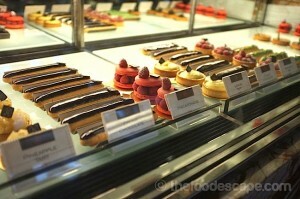 First of all, who can resist line of beautiful macarons in a glass display? I certainly can’t, so despite of how tiny the macarons are, I tried 3 of them. 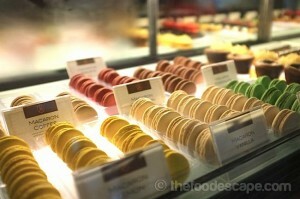 The macarons are very fresh, crunchy and soft in the same time, the best kind of macarons that is unbeatable. 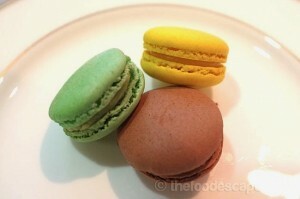 These ARE real French macarons and definitely what macarons should be, with right texture and sweetness. The fillings were really nice with very distinctive tastes and I couldn’t even pick 1 as favorite! 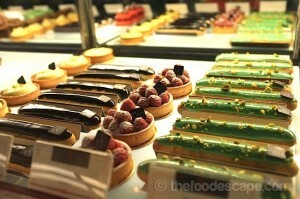 Don’t go to any French bakery without buying the eclair. 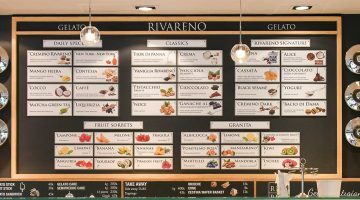 And my pick this time was the coffee flavor, although the others (such as pistachio) looked really beautiful and tempting. 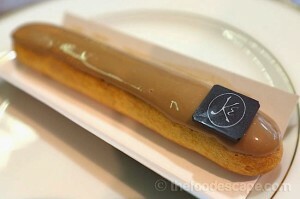 The eclair was what I call a total satisfaction, seriously. The coffee glaze was disturbingly addictive. 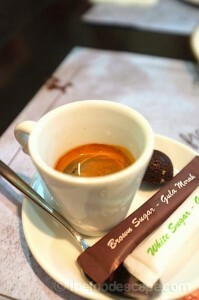 It is not only sweet coffee glaze, but had real taste of coffee with a little hint of bitterness, also very soft and melted beautifully inside the eclair. 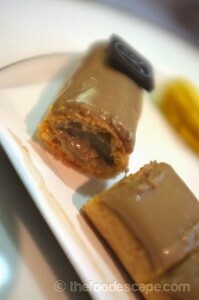 I was so glad I ordered coffee one because seriously I had never eaten coffee eclair as good as this! 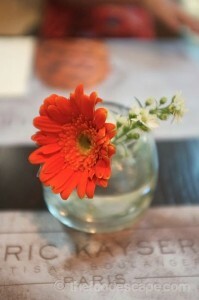 While Ciabatta is originally from Italy, Eric Kayser’s version was impressive, too. The Monge bread is available in some sizes, and we picked the smallest one. 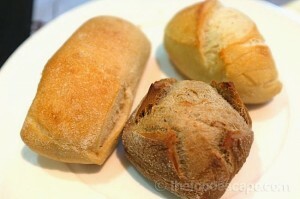 Monge bread is made from wheat flour and natural raising agents, having crisp crust and a soft airy center. 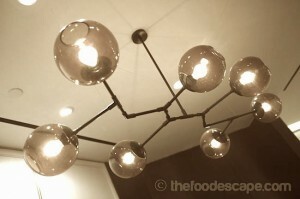 It has a fresh taste with springy elastic textures. 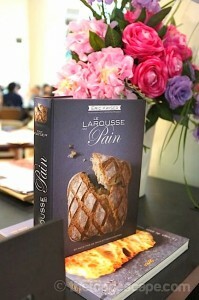 Pain Rustique is rustic bread with usually freeform shape. 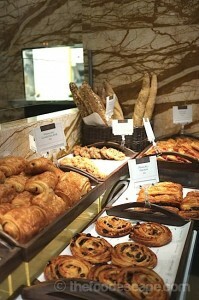 Like usual European breads, they were quite hard but Eric Kayser’s version are chewy hard and simply nice! Each bread has strong flavor of the flour and was made with perfect amount of salt so they were already tasty eaten just like that. 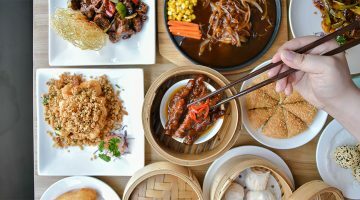 The staffs were very kind and helpful that when they served this on the table, they would ask whether you need some butter or not. And seriously, I didn’t expect the breads were THAT cheap, so I will definitely put the bakery on the shopping list whenever I need some good breads! These were heavenly good, OMG! I don’t even know how to describe but the croissant was the kind that I love so much and it brought back so much memories when I ate it. It was light in texture, with very crispy skin and soft when bitten, just PERFECT! Beside that, it has the fragrance and taste of rich butter so it goes really well with coffee, just like enjoying croissants in real French cafes. 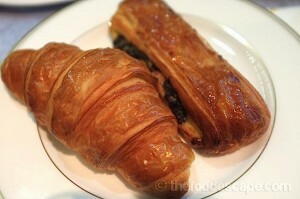 When I was eating, it just suddenly hit me that I had been missing such a buttery croissant for a while, and I am glad now I found a place to go to when I need one! 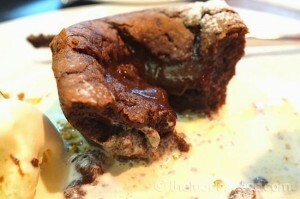 The Plie Chocolate was nice, too, although it was very fulfilling because of the butter and sweet chocolate. But well, by the time I ate that, I already fed myself with so many stuffs, LOL! Financier is small French cake that is usually made with beurre noisette (brown butter). 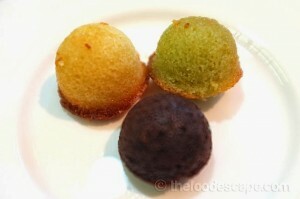 These financier are mini version, so they are really tiny. 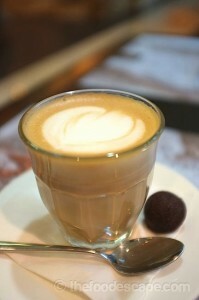 They were great to be enjoyed with coffee or tea as light snack, the taste was like butter cookies and not too sweet. Espresso Single is always too bitter for my liking, but Mr. K loves it. Surprisingly, their version was incredibly nice. A good balance to accompany your sweet pleasure. 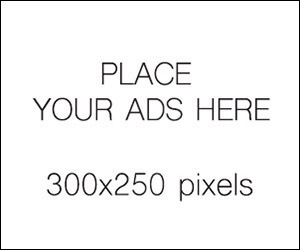 Geez, I love this. Nuff said. 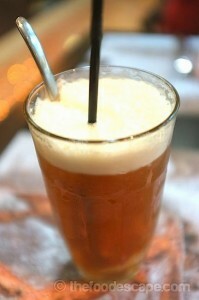 These tea drinks were absolutely refreshing and surprisingly so nice. 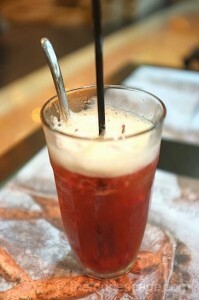 I loved how they serve the liquid sugar separately, so when served, the drinks tasted like tea with real fruit slices. Well, I was thinking that I just wanted to try some of their products, but in the end, I couldn’t resist picking so many from the available options. 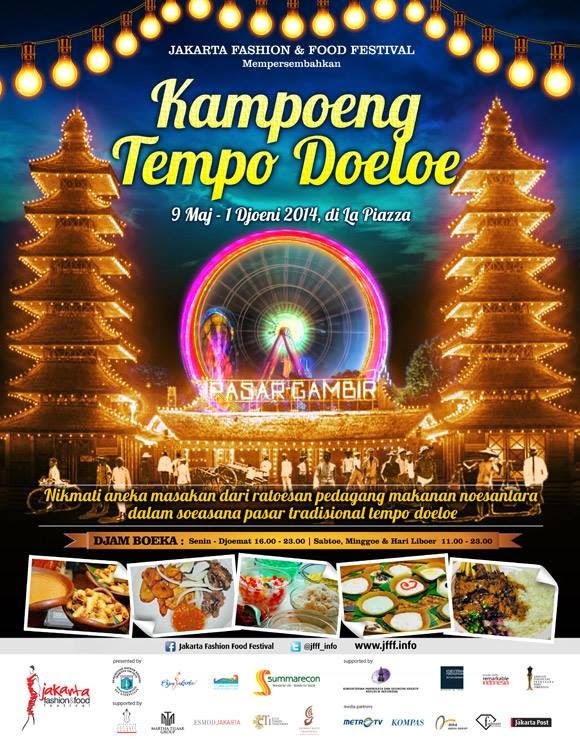 Trust me, it is very difficult to pick only few because everything just looks so good and delicious. Especially in bread and pastries section, I totally “lost control” and felt like I wanted to grab everything! The nicest part is you can proceed right away to the cashier for take away or if you want your bread/pastries to be eaten there, they can warm them up for you. 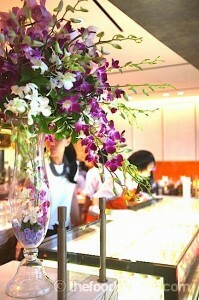 And for the service, NOTHING BEATS GREAT SERVICE to please your guests. 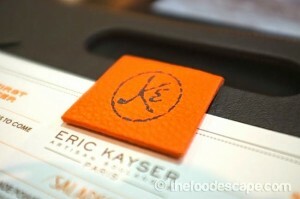 And Eric Kayser Jakarta seriously keeps this in mind! The service ROCKS. 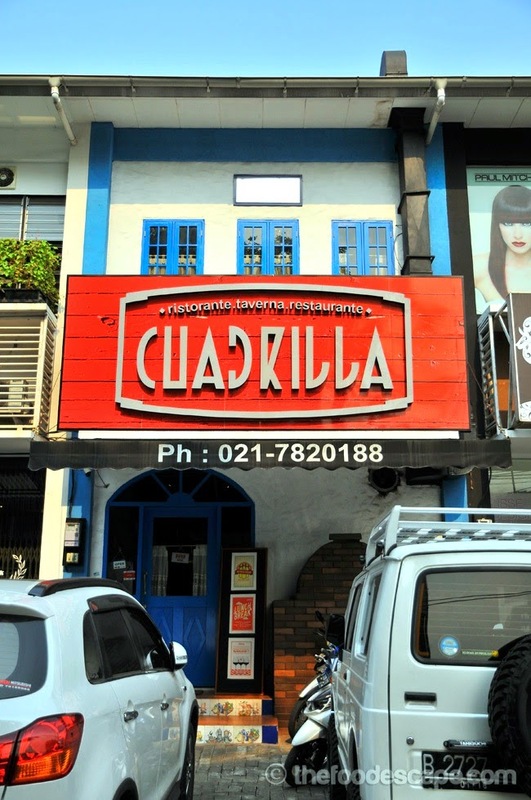 The staffs were very helpful, polite and they kept their eyes on the guests: no empty plate was left for long, giving recommendations, welcoming smiles and gestures, TOTAL SATISFACTORY. And since my visit was just within the first week of opening day, I would totally understand if there was any miss here and there, but everything was simply flawless. 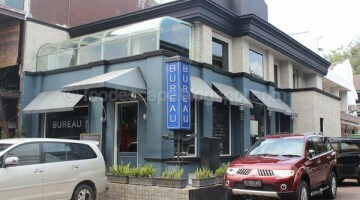 The owners seemed to be there and joined the staffs managing and serving the guests, too; so bravo for them. 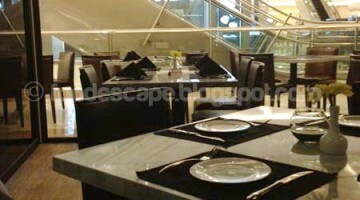 Hopefully the great service will be maintained and bring more smiles and satisfaction to other guests in the future! 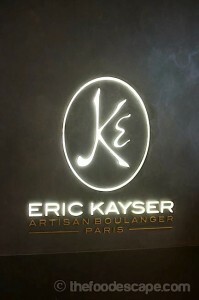 Last but not least, welcome to Jakarta and I am SO GLAD that Eric Kayser Artisan Boulanger finally opens here, I will definitely be your super loyal customer!